Painter, pastellist. Nudes, portraits, landscapes, landscapes with figures. Designs for stained glass, tapestries. From 1898 to 1905, Roger Bissière attended the College in Cahors. From the age of 17, he had begun to paint and from 1905 to 1910 he attended the École des Beaux-Arts in Bor­deaux. In 1910, he went to Paris and studied under H. Gab­riel Ferrier. One source places him in North Africa from 1911 to 1918 and another source mentions trips to Algiers, Rome and London during this period; other sources are silent on this period. Following World War 1 he was earning a modest living as a journalist. From 1919, he formed friendships with other artists, André Favory (1889-1932), then André Lhote (1885-1962) and Georges Braque (1882-1963). 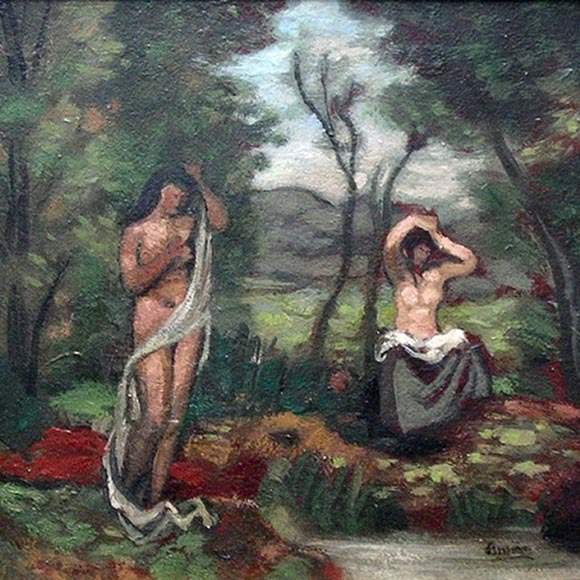 In 1920, he published in L'Esprit Nouveau (New Spirit); Notes sur l'Art de Seurat (notes on Seurat's Art), and in 1921; Notes sur Ingres (Notes on Ingres) and Notes sur Corot (Notes on Corot). From 1925 to 1938, although convinced that ‘nothing can be taught', he was a teacher at the Académie Ranson, an in­stitution which produced artists including Jean Bertholle (1909-1996), Alfred Manessier (1911-1993), Le Moal, Alfred Pellan (1906-1988) and Vieira da Silva (1908-1992). In 1938, he returned to his native town to convalesce from congestion of the lungs, and simultaneously this return to nature aroused his interest in landscape as a painting theme. In 1939, he settled in Boissiérettes, in the former family home. The outbreak of a new war overwhelmed him with sadness. Suffering from glaucoma and threatened with blindness, he stopped painting completely: 'I had nothing to say, events had drained me.' This period of inactivity was to last from 1939 to 1944. In 1945, using the 'collage' technique, he started producing a series of tapestries by putting pieces of rag together from all kinds of scraps, shredded and tangled, which were sewn and embroidered by his wife; in these collages, which had almost no connection with his earlier work, people were witnessing the birth of what was to be the artistic language of his later years and would constitute his body of work internationally; 1946, The Sun - the Little Horse. However, in 1948, he had an operation, and he began to paint again. In 1952, by which time he had become well known, he was awarded the Grand Prix National des Arts. At the same time as he was producing paintings, he made engravings and produced illustrations and cartoons for stained glass. In 1954, he illustrated with woodcuts the Cantique à notre Frère Soleil (Hymn to our Brother Sun) about St Francis of Assisi. In 1960, he designed stained glass Windows commissioned for the cathedral of Metz. In 1962, after his wife's death, he produced a collection of paintings reproduced in a book entitled Journal en Images 1962-1964 (illustrated Diary 1962-1964). Aside from the period when he produced sewn tapestries, his work divides into two distinct parts. Bissière himself said that 1919 was the year of his actual beginnings, probably due to his meeting with Favory and especially with André Lhote, then Braque. Lhote and Braque introduced him to Cubism, which would influence the whole of the first part of his output. Just as with Matisse's Fauvism, Cubism influenced almost the entire generation who were active between the wars; this generation devoted itself to the project, as Jacques Lassaigne wrote, 'of inscribing Cubism in the 17th century French tradition', eclipsing by the same token the beginnings of the Abstract art adventure which was happening elsewhere, except in the case of the isolated members of Cercle et Carré (Circle and Square) and Abstraction-Creation . In the case of Bissière, when he published his articles in their journal L'Esprit Nouveau (New Spirit) in 1920 to 1921, a certain rigorous understanding of this diluted version of Cubism led him to rub shoulders with the Purisme (Purism) of Jeanneret and Amedée Ozenfant (1886-1966). In 1927, he produced a series of landscapes which foreshadowed his development towards Abstraction in his later years, which he rediscovered and adopted. 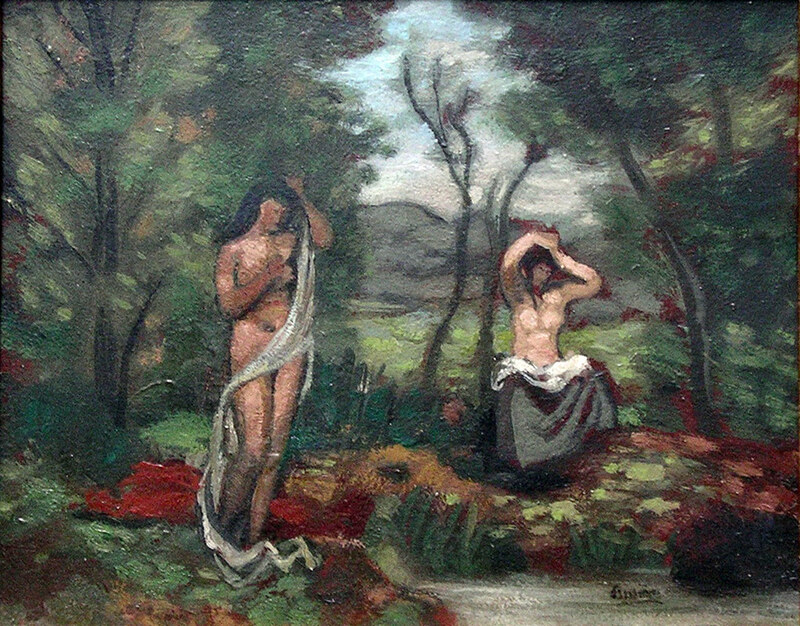 In his paintings after 1948, the final elements of a resemblance to an external reality, which had been sinister, disintegrated, leaving the field open to the more play of line with line, retaining touches of colour changing with the mood of the day, positioned either side by side or superimposed. This was the culmination of a language appropriate to his internal poetry: marks, patches of colour and apparently nothing else but more painting and for the rest literature; except for sometimes letting the viewer guess, in the first paintings, the sketch of an angel, faun, bird, star or Sun: 1945, Angel in the Cathedral - the Black Ve­nus; 1946, Shepherd.